Hi! Long time no see. You know how BTS is... and as soon as I feel like it's slowing down another part of the fun begins. I have RESA coming up soon, parent teacher conferences along with other "extra" demands from the higher up coming down the pipes. We JUST got out Student Growth Measure assessment for our evals (in Ohio, student growth accounts for 50% of your teacher evaluation). You know. EIGHT weeks into school. Sometimes I wonder what they think we are doing each day in our classrooms. We have already made so much progress. I am truly amazed about how far my little friends have come, and I wish that they would get credit for ALL of that growth. SGM (Student Growth Measure) assessments should really come out the first week of school to have a true picture. Not the eighth week of school, and they are due at the end of March. That does NOT reflect a true year of growth. More like six months. I don't get it. Moving on before I really get myself going. 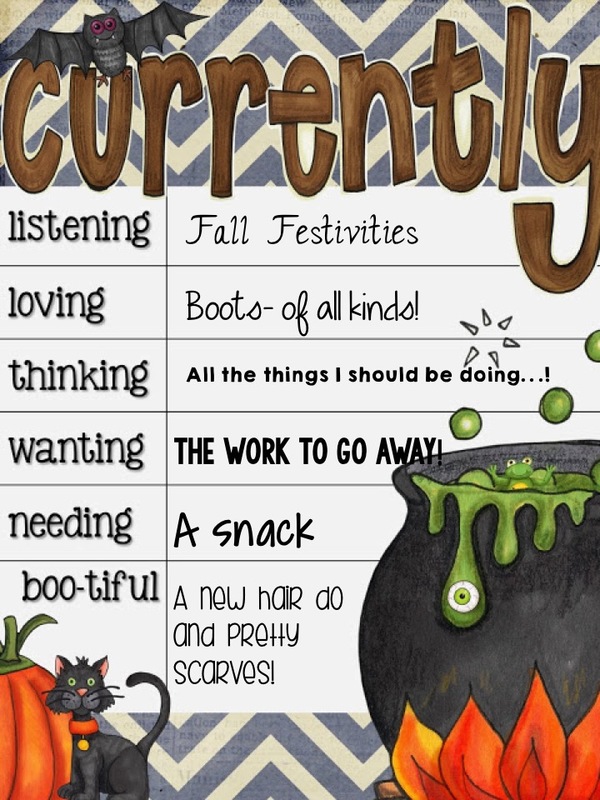 I am linking up with Oh Boy Fourth Grade for Currently month of October! Loving: I should just admit it. I have more boots than any girl needs. But yet I am looking for a cute pair of black booties. I have Bean Boots, riding boots, shortie Sorel boots, Joan of Arc Sorel Boots, patterned Sorel boots, Frye brown booties, Hunter books, short rain boots, and Kenneth Cole Biker boots. Yet here I am... looking for more boots... haha! Thinking: I have three term papers for grad school I need to write. Wanting: Speaking of which. Someone want to write my papers? Needing: A snack. I have since gotten one. I have blue cheese bacon fries sitting next to me. At least fries are made out of potatoes... and potatoes are vegetables... right? Boo-tiful: I seriously have the best hair dresser. I love her. and I love her talents. I leave the salon feeling renewed all thanks to her. I am also loving scarf weather, finally! While I am here, I wanted to tell you about a new Forever Freebie! I wanted to get interactive with story elements. 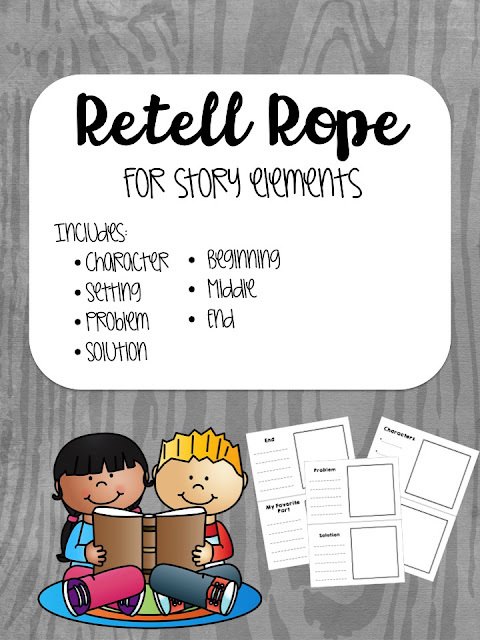 My kiddos love coloring, cutting, and everything in between so we made these cute little Retell Ropes! We read the story Crazy Hair, which is adorable. If you have not read it, please do. It's the sweetest story about a class really coming together as a family. Then, we filled out each page as a class. After, the kiddos colored, cut, and taped onto string. I let them tape their papers on themselves. I was really interested to see who could figure out how to tape them on. I know it's not in the curriculum, but it was a great way for my kiddos to practice being independent! And let me tell you, I think these are adorable! For realz... Look at how cute the crazy hair is in this picture!!! I am in LOOOOVVVEEE! It is such a fun way to practice story elements! Hop on over to my TpT Store to check this cute little project out! And don't forget to link up with Farley at Oh Boy Fourth Grade!